Top things to do and places to visit in Reims, France. What to visit in Reims? Located at only 45 minutes by train and 1h30 by car from Paris, you can easily go on a day trip to Reims from the French capital to visit the Champagne region. Known for its famous Champagne Houses, its vineyard and historical heritage, Reims has a great architectural and gastronomic wealth. The UNESCO has besides recognized the city assets by classifying at the beginning of the 90’s its famous cathedral, the palace of Tau and the old Saint-Remi basilica and in 2015, the landscape of Champagne and its vineyard. The best time to visit depends on your lifestyle : in summer (July, August…), the weather is really pleasant, and in winter (December), the old town is really nice with its Christmas market set on the cathedral’s square. You can visit numerous historical monuments of various architectural styles (Gothic, Art Deco) and encounter local producers and famous French Champagne Houses such as : Taittinger, Pommery, Ruinard, Mumm, Bollinger, Veuve Clicquot…. 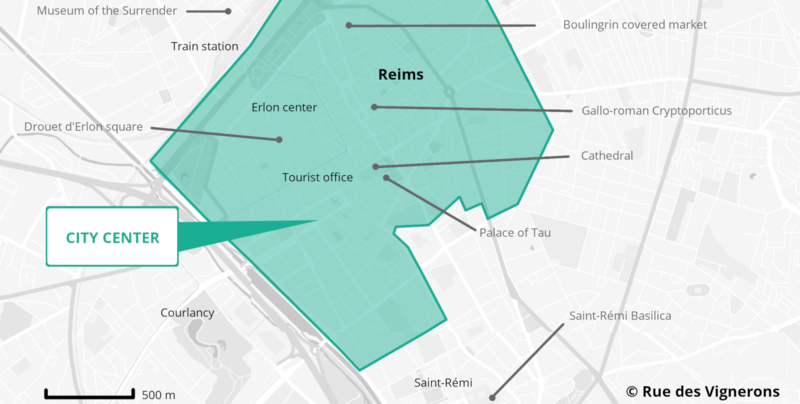 If you’re wondering what to do in Reims and why you should visit Reims, discover here a selection of tours and places to visit in and around Reims. Go directly to the section of your choice: Reims Cathedral and Palace of Tau, Drouet d’Erlon Square, Gallo-Roman Cryptoporticus, Museum of the Surrender, Boulingrin covered market, Art Déco Tour, Saint-Remi Basilica, Champagne Park, et Champagne Houses and Producers. The first must-see in the city of Reims is its cathedral. Present in every historical book for having crowned many kings of France, this cathedral is a gem of the 13th century Gothic art. As a large part of the city, the cathedral was burned down by the German artillery during the First World War. It was restored throughout the 20th century, with the participation of famous artists such as Marc Chagall who realized three stained glass windows. Despite the destruction, the cathedral still has stained glass windows dating from the 13th century such as the famous “rose window” on the main facade. In the spring and during the summer period, you can also enjoy the free night show “Dream of colors” combining sounds and lights. This spectacular show relates the cathedral history and the different stages of its construction. In December, the Christmas market is one of the most expected event of the year. It is the 3rd largest Christmas market in France, with many activities (concerts, local craftsmen…). If you want to learn more about the cathedral and its history you can visit the Palace of Tau, located just next to the cathedral. Former home of Reims archbishops and royal residence during French kings’ coronations, the Palace of Tau is nowadays a Museum tracing the cathedral history and the French kings’ coronations. Around the cathedral, you will find cafes, restaurants and tourist shops where you can buy Reims specialties. Besides the Champagne, one of the great Reims specialty is the Rose Biscuit produced by Maison Fossier, the oldest French biscuit company. Other gastronomic specialties include gingerbread and ham from Reims. At lunchtime you can go to the Drouet-d’Erlon square. It is a shopping street along which you will find cafés, bakeries, shops and nice restaurants offering various dishes. In the center of the square, you will see the Subé fountain, sumounted by a golden angel statue, symbol of Reims. The city of Reims also has remains of the Gallo-Roman era. On the Forum square, a 5-minute walk from the cathedral, you can visit the Gallo-Roman Cryptoporticus, galleries located under the square that were at that time a covered market for the Romans. During the summer it houses spectacles where various artists and groups perform. If you are in Reims on a Wednesday, Friday or Saturday morning, you can start your day with a visit of the Boulingrin covered market. You will find local products, fruits, vegetables, flowers, meat, fish, organic products… in a relaxed atmosphere. The building itself is worth a detour by its Art Deco style of the 20s, a pride for Reims since its inauguration in 1929. If the Boulingrin covered market is not open the day of your visit, another option is to discover the architectural heritage of Reims through a visit on the theme of the Art Deco of the 1920s. 80% of the city of Reims was destroyed during the First World War and rebuilt from the 1920s which explains its architectural diversity and originality. A pedestrian discovery circuit, called « open-air museum » was set up on the theme of Art Deco. A 3km itinerary is punctuated by nearly 30 information panels. This tour will take you to significant buildings and architectural elements of the 1920s, including the Subé fountain, the museum of Fine Arts, the Carnegie Library, the Saint-Nicaise Church and the Grand Théâtre for its interior design. You can visualize this circuits on maps at the exit of three car parks of the city center (Erlon, Gambetta and Buirlette). In the south of the city you can visit the Saint-Rémi basilica and its museum. In a Romano-Gothic style, it houses the relics of Saint-Rémy and has a magnificent nave. Less touristic than the Cathedral it is also very linked to the French Kings history and is a good complement of the cathedral visit. The Saint-Rémi museum is adjoined at the Basilica and is located in the former Benedictine Royal Abbey. It relates the history of Reims and its region from prehistory to the Renaissance. The Basilica and the museum are inscribed on the UNESCO World Heritage List. You can continue your discovery of the city and the surroundings by visiting a Champagne House. In the surroundings villages, many winemakers will be happy to welcome you to their winery to visit their cellars and taste their wines and champagnes. For those who want to discover the backstage of a major Champagne House you can visit the cellars of the famous Mumm Champagne House, located in the heart of Reims. Their magnificent underground cellar, a visit of a Champagne Museum, and a wonderful Champagne tasting will ensure a great experience. Also located in the heart of the city, Taittinger Champagne House offers a visit of its historic structure (underground cellars in Gallo-Roman chalk) and several Champagne tastings formula. At 15 minutes’ drive from Reims, the Champagne House Carnard Duchêne welcomes you in Ludes in the regional nature park of Reims. You will visit one part of the 6km of the cellar, with explanations on the processes of Champagne making and to finish you will taste 2 prestigious champagne. For those who are looking for a small Champagne House where you will meet the producer itself and discover champagnes of a good value for money, you can go to the Mr. Brugnon Champagne House located at fifteen minutes’ drive from the center of Reims. Finally, if you want to meet a passionate and welcoming winemaker, go to Champagne Lamblot winery located in the village of Janvry at 20 minutes’ drive from Reims. It is a family-owned winery since several generations. You will visit the vineyards with the winemaker who will explain the issues of organic farming. You will also immerse yourself in the traditional cellar, containing very old vintage. You will taste multiple Champagne of good quality, including a premier cru. If you have a whole day, take the opportunity to discover the city of Epernay, also called the « Capital of Champagne ». Located at 20 minutes by car and 30 minutes by train from Reims, Epernay also includes different Champagne Houses and Champagne Producers that you can visit (De Castellane, Moët & Chandon, Nicolas Feuillate… ). We wish you a pleasant discovery of Reims and its region ! Visit Epernay Discover top attractions, activities and must sees in Epernay in Champagne.